On Sunday, St. Patrick’s Day, I was signed up to bring breakfast treats for our church brunch. It being St. Patrick’s Day, we went a little crazy with the green–green hard-boiled eggs, green pigs-in-a-blanket, green fruit dip, green fruit…well you get the idea. By far the favorite thing we created was our Mint Chocolate Chip Muffins. In fact, one little boy, who rarely speaks said to his grandma, “Grandma, these muffins are the best ever!” Lol. Well you’ve got to enjoy the food review of a 4-year-old. So cute. All that to say, here is the recipe to those “now-famous” Mint Chocolate Chip Muffins. They are great for St. Patrick’s Day, Christmas, or anytime. 1 12 oz. package semi-sweet chocolate chips. Mix dry ingredients in stand mixer. Mix butter, milk, eggs, green food coloring, and peppermint extract in a separate container. Add to dry ingredients in stand mixer and mix until well combined. Add chocolate chips, stirring on a low setting until combined. Pour into lightly greased muffin tins. Baked 20-22 minutes at 350 degrees. On a side note, did you know that St. Patrick was actually one of the first missionaries to bring the Good News of Jesus Christ to Ireland? Yeah, I know. Who’d have thought with some of today’s St. Patrick’s Day celebrations, right? Born in Great Britain, St. Patrick was taken prisoner by a group of Irish raiders at the age of 15 or 16 where he was held captive for 6 years. During this time he worked as a shepherd in complete isolation; only his relationship with God served as his comfort and peace. Once he escaped Ireland, he returned to Great Britain to train for 15 years as a priest. He then returned to Ireland as a missionary with the sole purpose of bringing the Irish (his former captors) to Christ. True to St. Patrick’s Day he often used the 3 leaf clover/shamrock to explain the trinity–three leaves in one. His ministry is said to have lasted approximately 30 years and his lifelong impact changed that nation for all time. So, next time you celebrate St. Patrick’s day, be sure to share with your kids about the TRUE Saint Patrick. His story is an inspiration for many. Sigh, anything that involve chocolate and mint is sure to be delish! Hi! Followed you over from Ginger Snap Crafts blog hop. These look awesome! 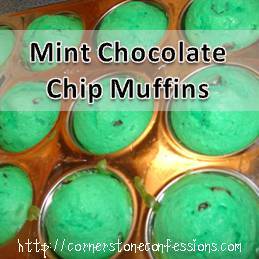 My husband would love these since he loves mint chocolate chip. Now following you via FB. Welcome! I’m so glad you hopped over! Glad to have you along! oh wow, I think my husband would LOVE this! He is a mint choco nut ;o) thanks for sharing your yummy recipe with us all. You are welcome! I hope he likes them! Those look great. I will be featuring this tonight at my Swing into Spring party that opens at 8pm EST. Please stop by and pick up an I’ve Been Featured button. Thanks.